In a division that includes two powerhouses and an upstart projected at the top, the Blue Jays seem likely to be left in the dust, much like the Orioles. The Blue Jays finished last season 16 games below .500 at 73-89 — good for fourth place in the AL East — with the Orioles acting as the only buffer between them and the division cellar. As far as run differential in 2018, the Blue Jays were in the red (-123). Since last year, Toronto has slashed its payroll by roughly $44 million, from about $150 million last year to about $106 million this year, according to Spotrac. They also cut ties with manager John Gibbons at the end of the 2018 season after six years running the ship, which doesn’t include the four years he managed the club from 2004-2008. Expectations don’t seem to be that high this year, seeing as the Blue Jays had virtually zero impact signings during the offseason, opting instead to acquire veterans on minor league deals or one-year pacts. Even Marcus Stroman voiced his frustration with the offseason in general, pointing out all the able-bodied free agents and calling for his team to add more pieces. The Blue Jays’ offseason additions started with a new skipper — Charlie Montoyo — who is a first time MLB manager. He previously served eight seasons as Tampa Bay’s Triple-A manager, then two years as the big league third base coach, and last year as Kevin Cash’s bench coach. Over the winter, the Blue Jays signed infielder Eric Sogard and reliever John Axford to minor league deals. Starter Matt Shoemaker, reliever David Phelps and shortstop Freddy Galvis were added on one-year deals, while left-hander Clayton Richard was acquired from the San Diego Padres. Reliever Bud Norris was added during spring training on a minor league contract as well. Toronto also jettisoned a few notable veterans. Infielder Yangervis Solarte was non-tendered, shortstop Troy Tulowitzki was released and catcher Russell Martin was traded to the Los Angeles Dodgers. Marcus Stroman headlines the Jays’ rotation, and he will look to bounce back from a poor 2018 where he posted a 5.54 ERA in only 102.1 innings. After Stroman, there’s Aaron Sanchez, who didn’t fare much better in a similar amount of innings last year — 4.89 ERA in 105 innings. Toronto will need these two to pitch up to their abilities in order to have any hopes of competing this year. Rounding out the rest of the rotation is newly acquired lefty Clayton Richard, who will have to prove he can pitch effectively when on a mound other than that of the spacious Petco Park. Last year with the Padres, he had a 3.94 ERA at home and 6.67 on the road. Matt Shoemaker is in Toronto on a one-year deal but he’s a question mark considering he pitched fewer innings than Stroman and Sanchez last year. Newcomer Sam Gaviglio projects for the fifth starter spot and he’ll look to establish himself after debuting in the bigs last year at age 28. Flame-throwing right-hander Ken Giles profiles as Toronto’s closer after taking up that role when acquired from the Houston Astros last summer. He had 14 saves in 19.2 innings with the Jays last year. Bud Norris is a potential set-up man who also happens to have closer experience, having registered 28 saves with the St. Louis Cardinals last year. Ryan Tepera and John Axford are two potential late-inning pitchers, as long as their health cooperates. Both have been dealing with sore elbows recently. David Phelps figures to see action in some high-leverage situations as soon as he is fully recovered from last year’s Tommy John surgery. Toronto may have scored only 709 runs as a team last year — ranking them 17th out of 30 teams in baseball — but they showed a lot of pop at the plate. The Jays had the fifth most home runs in baseball (217) and they are returning four starters who had at least 20 home runs last year — Randal Grichuk, Kendrys Morales, Teoscar Hernandez and Justin Smoak. But the Jays’ lineup will miss second baseman Devon Travis, who has been snake-bitten by the injury bug early on in his career. His latest knee setback will cause him to miss the start of the year. Danny Jansen will have the chance to prove himself as Russell Martin’s replacement behind the plate, having put up a .269/.367/.410 batting line across six minor league seasons. Freddy Galvis slots in at shortstop, bringing with him a .246 lifetime batting average. Brandon Drury will look to improve on his meager showing in limited action last year after being acquired in a midseason trade with the New York Yankees and Lourdes Gurriel Jr. will look to improve on a modestly successful rookie year that saw him hit .281 with 11 home runs in 249 at-bats. Human highlight-reel Kevin Pillar anchors Toronto’s defense in center field. After six years in the show, how does this guy not have a Gold Glove? Looking closer at Pillar’s UZR over the past few years, he may have peaked in 2016 at 12.2, considering that he put up a 5.4 and 2.3 in 2017 and 2018, respectively. Last year, Teoscar Hernandez had a -8.6 UZR in left field and Randal Grichuk had a 2.9 UZR in right. Looking across the league, the Blue Jays actually had the fifth fewest errors in baseball last year (100). Catcher will be an important position to watch for defense, seeing as the steady veteran Russell Martin will be replaced by an unproven youngster. Shortstop Freddy Galvis seems to be on the downswing defensively, having peaked in 2016 with a 14.9 UZR but a -4.4 last year. 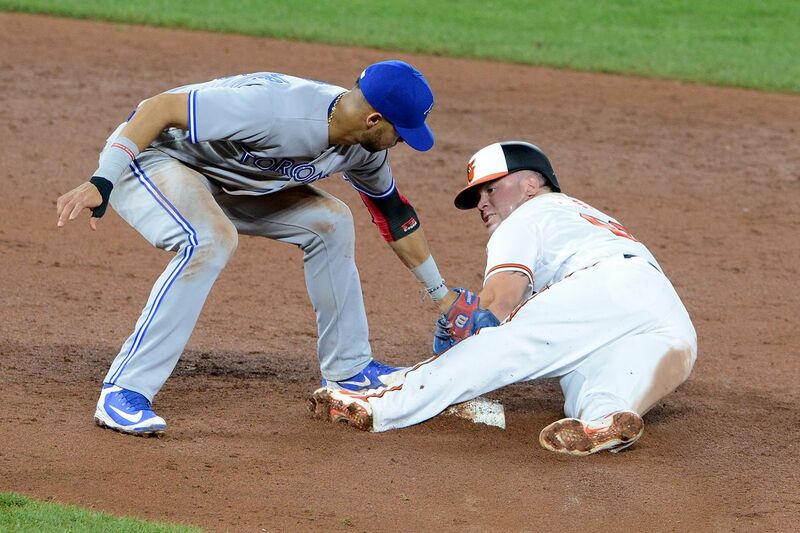 Time will tell whether the Jays defense can be greater than the sum of its parts. So the Blue Jays are projected to be bad this year, but not Orioles level bad. It looks like there’s a good chance again, like last year, that Baltimore will be the only thing between Toronto and the AL East cellar. Neither team has much of a chance to hang with the big boys of the East, or the Tampa Bay Rays for that matter. The Jays’ success will rest in large part upon the success of their pitching, like any other team. And that is a risky proposition for this starting rotation specifically. The offense and defense would have to be extra special to compensate for a suspect group of starters and allow the Jays to get within sniffing distance of their modest win projection totals. Is the new Trey Mancini here to stay? Orioles fans remain confident in long term even with team’s growing pains Everyone knows the Orioles won’t be very good this year. Almost everyone is confident in Mike Elias’s direction. Renato Nunez’s bat is one of the few bright spots early on for the Orioles The powerful right-handed hitter — long known for his prowess at the plate — has been the hottest player in the lineup in April, other than Trey Mancini. Thursday Bird Droppings: Where the Orioles have the day off The Orioles finally won a home series! They picked up their 10th win to boot, making today a fun off day. Orioles minor league recap 4/25: Adam Hall has big day for Delmarva, Bowie gets no-hit Hall had five hits for the unstoppable Shorebirds, who were the only victorious minor league team in the Orioles farm system on Wednesday. Orioles escape with 4-3 win, take series against White Sox The tying run reached third base, but Mychal Givens and the Orioles escaped with a one-run victory. Stevie Wilkerson hit his first career home run, and John Means picked up a win on his birthday.